The Reds headed south for the Mexico Series this weekend, but they’re heading north in the NL Central standings. Cincinnati extended its winning streak to four with a 5-3 win over the Cardinals, putting them a half game ahead of the Cubs for fourth in the division. Turns out the sky wasn’t falling after all. Through five innings, the Reds managed only two baserunner — walks by Scott Schebler and Eugenio Suarez. Adam Wainwright kept Reds hitters completely off balance, allowing almost no hard contact the first two times through the order. The dreaded third time through the lineup ended his dominance, however. With one out in the sixth, Jesse Winker hit an opposite-field homer to end the no-hit bid and the shutout in one fell swoop. Joey Votto followed with a double down the right-field line but was left stranded at second base. Derek Dietrich delivered the knockout blow to Wainwright in the seventh with a go-ahead solo home run. Dietrich now leads the team in home runs with four. Reminder: the Reds signed Dietrich to a minor-league contract and that will never not be utterly ridiculous. Phil Ervin got his first MLB action of the season and wasted no time making his presence known. Appearing as a pinch hitter, he led off the eighth inning with a triple on the first pitch he saw. Schebler drove Ervin home with a two-out single to give the Reds an insurance run. But the Reds weren’t done. Dietrich came up huge again with a two-run triple off the glove of right-fielder Tyler O’Neill to extend the lead to four. Tanner Roark wasn’t dominant by any means, but he turned in his best start as a Red. In 5 1/3 innings, he gave up one run, six hits, and one walk and hit a batter. He struck out five. He worked around a leadoff triple to left field by Matt Carpenter in the first inning (more on that later) by striking out Paul Goldschmidt and getting a pair of flyouts. The bottom of the Cardinals’ order got to Roark in the second when Dexter Fowler doubled and scored on a single by Wainwright. That was the only run Roark allowed. He scattered three hits and a walk over the next 3 1/3 innings. David Bell pulled Roark in the sixth inning after the Cardinals had pair of hard-hit balls — one a ground-rule double by Marcell Ozuna and the other a lineout by Yadier Molina. Garrett and Jared Hughes combined for a perfect seventh inning. David Hernandez and Zach Duke teamed up for a scoreless eighth, with the latter forcing a 6-4-3 double play to end the inning. After the Reds had taken a four-run lead in the bottom of the eighth, Duke returned to the mound for a second inning of work. Wong took him deep on the fourth pitch of the inning, prompting Bell to bring in Raisel Iglesias. The Reds’ closer gave up a walk and a single to put runners at the corners but retired Goldschmidt and Ozuna to end it. It was weird not having any Statcast data tonight. Let this be my official plea for Estadio de Béisbol Monterrey to install it next year. You might look at the box score and assume Carpenter’s triple was hit in the gap and took a funny hop off the wall. Oh, how wrong you’d be. It was nothing more than a pop-up into left field. But the Reds were shifted to the right side and the ball got lost in the sun. It fell in front of the four-man outfield and beyond the outstretched glove of third baseman Suarez. Carpenter was probably getting a double either way, but the ball took a wicked hop off the field turf and skipped past Dietrich — who moved from second base to left field — letting Carpenter get to third base. All three of Winker’s home runs this season went to the opposite field. Turns out he has plenty of pop in his bat when his shoulder is healthy. Reds pitchers struck out only nine batters tonight, ending the streak of three straight games with double-digit punchouts. Old friend Homer Bailey threw seven shutout innings for the Royals tonight. Good for him. As I was looking up this stat, Joel Luckhaupt beat me to it. The Mexico Series will wrap up on Sunday at 4:10 p.m. ET. Anthony DeSclafani (6.75 ERA, 4.17 xFIP) will look to bounce back after an ugly outing his last time out. The Reds will try to solve Miles Mikolas (6.19 ERA, 5.91 xFIP), who has gone through a tough start to 2019 but dominated them last season. Nice comeback win. The Reds needed that. Dietrich is finding new life with the Reds. Game of inches. If Bader catches Ervins deep fly and O’Niell catches his ball, that 8th inning is a lot different. Luck was OKkn the Reds side tonight. We’ll take it. Read my mind. Both tough plays but catchable. It’s about time fortune favored us. Fun game. Roark battled after a weird start to the game, then was effective enough to give the bats time to wake up. Ervin, Dietrich and Schebler all clutch. Winker and Votto heating up. Puig contributed on defense and he will hit too. Some odd plays but on a strange trip and on a strange surface I’m not worried about that. How about a sweep tomorrow? Go Reds! I love the artificial turf. I wish mlb would adapt it. makes the game more exciting. 3 triples in one game! Is Dietrich a better defender than Scooter? They are probably roughly equivalent. This situation does point out why teams need not overspend for second basemen: they are a dime a dozen. It is no coincidence that the Reds found 2 of them off the scrap heap in 3 years. Yes Joe Morgan and Brandon Phillips weren’t really that important…. The Reds also paid the Braves $13m to take Phillips off their hands because his contract went a couple seasons too long. A lesson they’ve hopefully learned when it comes to Gennett extension talks. I’m encouraged that Roark always seems to go at least 5+ innings and keeps the team in the game every time. Certainly not dominant but gets the jobs done. Pretty much exactly what I hoped for out of him when the season started, a solid #5 starter. It’s going to be interesting to see how the OF situation works out once Senzel is healthy. It really doesn’t seem like Kemp has a spot on this team. I wonder if they would be willing to eat the remainder of his contract after Senzel is up. I just really feel that WInker needs to play every day, and once Senzel is up, he also needs to play every day. Neither should be losing starts to Matt Kemp, who I’m pretty sure is slower than me. I think Ervin deserves a spot on this team. The Reds should realize they already paid for Kemp and they are getting nothing out of him. DFA him. Bring Ervin up now. He is a significant defense upgrade and more of an offensive threat than Kemp. When Senzel is ready, we will cross that bridge when it comes. The starting pitching has really been a bright spot this season. Hoping Disco bounces back after a rough start. He looked good his first time out, hoping to see more of that. The bullpen is starting to rebound from a shaky start. A lot of that has to do with Iglesias rounding into form. But I also think Hughes has recovered from a few hiccups early, and Hernandez has been more effective recently as well. Happy Ervin gets a chance to get into the game and contribute right away. He does “deserve” to be on the team, but there’s just not a spot and it’s probably better for him to play everyday. But I hope he uses it as motivation and keeps going at it. He’s worked hard to get to this point. Joey Votto is just an entertaining watch. Both triples in the 8th were just out of reach, could have been an entirely different game if either is caught. Game of inches and sometimes you’re on the fortunate end, the Reds were last night. Maybe it’s just me but I’d really like to see Ervin get more PT. One observation from last night’s game: we did too much shifting to appease analytics. An interesting game. It’s always nice to put it on the Cards. Pitching, so far, has been a real positive. Bell gives the impression of being relaxed and I like the way he talks to his coaches in the dugout. I predict Dietrich is our starting second baseman next year with Senzel in CF. He is going to provide a real nice bridge to Trammel or Siri (at which time Senzel can move back to 2b). I actually hope this is something the Baseball Ops Mgt is considering right now, along with a possible extention for Iglesias. The trio of Iglesias, Peraza and Dietrich make for a formidable middle infield combination and quality depth on the MLB roster. The Reds traded Tanner Rainey, a 26-year-old, unproven minor league relief pitcher with limited upside for Tanner Roark, a proven MLB starting pitcher with one year of team control and limited upside. 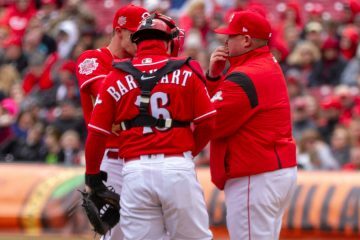 The Reds obtained Roark as a stabilizing factor for the back of the starting rotation. He was not an ‘ace’ or even a top-of-the-rotation contributor. He needs to keep the Reds in ballgames until the hitters have a chance to win the game. 5.1 IP w/ 6-H, 1-BB, 1-HPB, 5-SO, 1-ER … that’ll do nicely Tanner, especially against the dirty birds, very nice! That is exactly the type of performance the reds need from Roark. Without a put-away pitch and facing hitters like Carpenter and Goldschmidt, anything over 5 IP represents a successful outing for Roark. I too was very impressed with Roark last night. did just enough to keep the cards off the scoreboard in some tough spots. Thats all you need sometimes. A big ol’ tip of the cap! 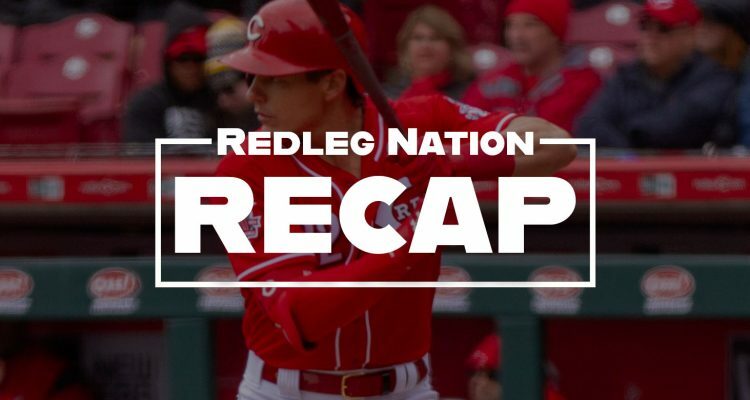 The Reds got off to a horrendous start to the 2019 season, but that amounted to just 9 games. Yet I still observe fans deriding the Reds for a few innings of a game or even a few pitches during a game or a few plate appearances during a game as evidence that the team still stinks and is incapable of playing competitive baseball. 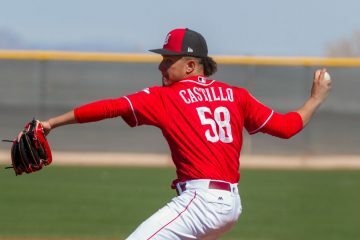 The Reds suffered significant production loss with the serious injury to Scooter Gennett and significant injuries to Nick Senzel and Alex Wood, yet the team perseveres. The Reds are 4.0 games out of 1st place in the NLCD, just 3.0 behind in the loss column. They are just 2.5 games out of 2nd place and 2.0 games out of 3rd place. If this was September 1st, the Reds would be in the thick of a playoff chase, yet people are still writing off the Reds with more than 140 games left to play. Despite the pitiful beginning (first half) of the season, let’s start giving the team their due for the overall results on the season and quit dwelling on the first few games. This can be an exciting team and the Old Cossack is fully on board. Geesh, Puig and Kemp are still to have any positive impact. And don’t forget Cossack, Bell is completely in over his head. Like we would know after a handful of games ?. I will grudgingly admit that I was a ‘little’ upset with the double switch after DB pulled Roark, then replaced Garrett after just 1.0 IP and 28 pitches. After reviewing the situation, I can’t really fault his decision to replace Garrett after facing Carpenter. We are all susceptible to knee-jerk reactions.